Emory University Department of Medicine is committed to creating an environment that fosters community service at home and abroad by providing volunteer service opportunities for our faculty, staff and trainees. Project M-PACT (Medicine Partnering Across the Community) aims to promote a sense of community with shared values and goals across the Department of Medicine; to support existing and foster new faculty, staff, and trainee involvement in local, national and international outreach and service efforts and to impact the larger community in a tangible way. If you have questions about how to get involved visit please review the Project M-PACT FAQs. The Emory University Division of Cardiology has partnered with the US Marine Corps Reserve to help children in Atlanta have a happier holiday season by providing toys to those in need. 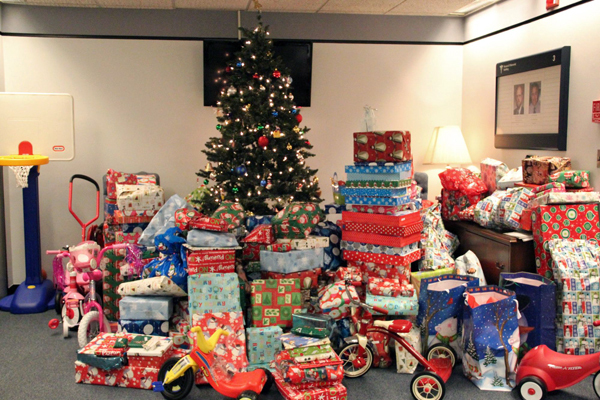 Toys for Tots collects new, unwrapped toys that will be distributed to local children. To learn more about Toys for Tots, visit www.toysfortots.org. As Atlanta’s first hospital sponsored by the Sisters of Mercy, Emory Saint Joseph’s Hospital has a wonderful heritage of providing compassionate, clinically excellent health care. Through primary care, pediatrics, dental, vision, health education, behavioral health, and HIV integrated treatments, Mercy Care gives dignity and an identity to its clients. ESJH sponsors the Run for Mercy 5K each year and all proceeds from the event support the Mercy Care team and their work to provide health services to the poor and marginalized. The 2017 run date has not yet been set, but we will have more details to come.